Tile flooring can be a great option when you're looking to renovate your bathroom or kitchen. There are so many options, and they tend to handle moisture much better than other options such as wood, or wood look-alikes. They may not be the easiest to install, but tiles can create a look that really brings together the kind of space you're going for. If you're new to picking out tile, it can be a tough choice to make with all the options on the market. To help you, we're going to take a look at 5 popular tile flooring options as well as what they have to offer. This is a great looking tile option that can really improve the look of whatever space you decide to use it in. It isn't the most low-cost option, but it's also not extravagantly priced either. 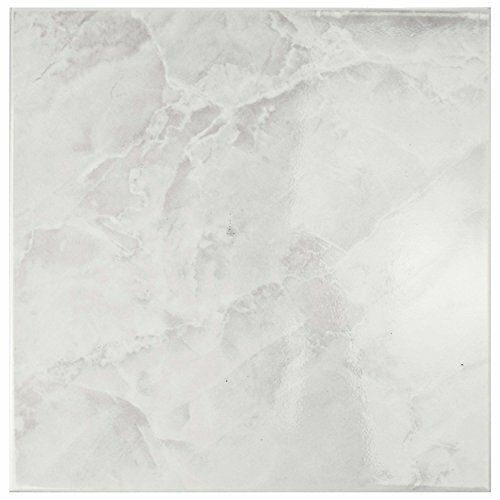 Each of the tiles you get when you order these are just under 8” in length and width, so that's going to be important to keep in mind when you think about the vision you have for your flooring. You'll also get about 10.75 square feet per box, so make sure you order enough to cover your space. These tiles have a really great design that will bring some liveliness into the space without becoming too busy. The muted colors also allow them to blend in rather than becoming an eyesore. They are also pretty decently priced when compared to other options. As with many things that are delivered, customers can sometimes find that some of the tiles they receive are broken. Because of that, it's a good idea to make sure that you check your order thoroughly as soon as possible after receiving it. While this is one of the more expensive options out there, these tiles back it up with a sophisticated look that will surely impress. For each box you order, you'll get about 10 square feet of tile. This is much lower than some of the cheaper flooring options in part because they're typically used to cover smaller spaces. 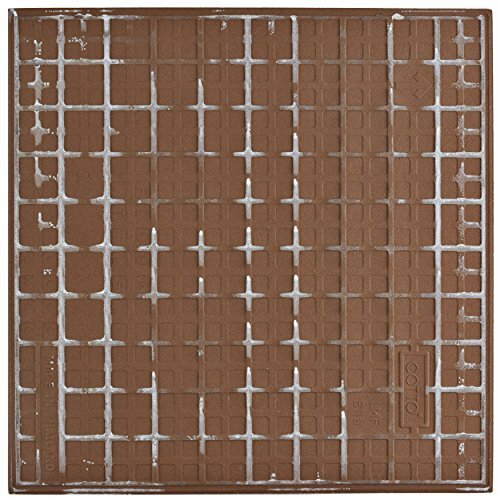 Each of these tiles is also 12” x 12”, meaning that each will cover a decent amount of space. One of the great benefits of these tiles is that they are made to be non-slip, making them a great choice for bathrooms and kitchens where they may be more likely to get wet. It's also a very aesthetically pleasing option, which will surely earn you many compliments. As earlier mentioned, this is one of the more expensive options. It also comes with a smaller amount of square footage per order than other flooring choices out there, which is important to keep in mind. In some rare cases, tiles can arrive in damaged condition. 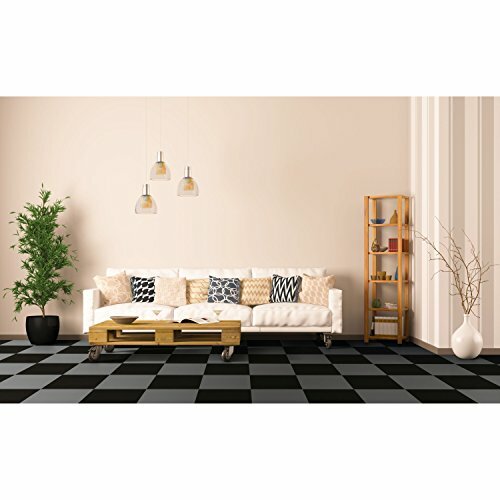 For those who prefer a white space, this flooring will fit in perfectly. 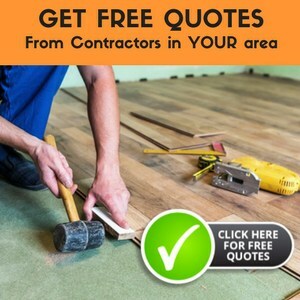 It's also rather budget-friendly, especially for those who only need new flooring in a smaller space. Each of these tiles is a little under 12” x 12”, so you'll be able to cover a decent space with the 20 tiles included per box. The white coloring is also a great choice for those who like a crisp, clean-looking area. They're made of high-quality ceramic and have a gorgeous marbled look. On this list, these tiles are one of the more affordable options. This is great for those who want to renovate a space without breaking the bank. It's also made to be easy to maintain, so you won't have to worry too much about accidentally damaging the tiles. It's important to be careful when choosing lighter-colored flooring because it can show dirt more easily than others. Because of that, this flooring might be best in areas that aren't very high-traffic and can be kept clean more easily. For those who are looking for something unique, these tiles are a great option! They are a little more expensive than other options but make up for it with a lot of character. Many of us have seen wood look-alikes in laminate and vinyl plank options, but what about tile that looks like wood? 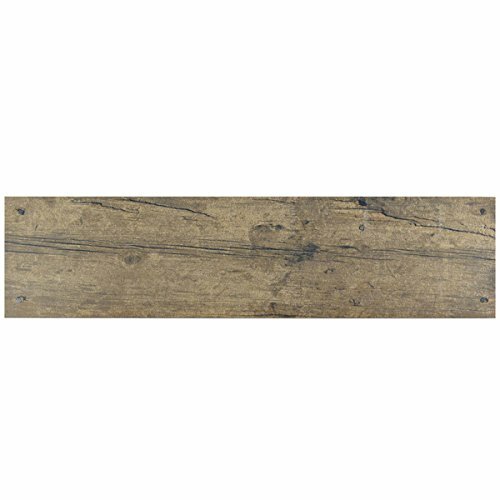 These tiles offer an authentic wood appearance, complete with the look of metal nails. For each box, you'll get 12 tiles that can add a lot of character wherever you place them! Unlike other tiles, these are shaped like planks. That serves to add to the wood-like appearance. It's also going to be able to cover a little more area than tiles of the standard shape. This is really a great way to get the look of wood without having to worry as much about water damage. Though they are lager, the number of tiles you get per order are fewer than other options. It's going to be important to weigh this out to see if it's still worth the cost. These tiles should also be kept in relatively warm areas as they aren't frost resistant. Another great look is that of stone. This flooring offers the appearance of stone without the odd shapes or other aspects that can make renovating more difficult. They also come at a lower cost than some other options out there, while maintaining a great look! Aside from the great look, the tiles in each box are larger than many of the other options out there. 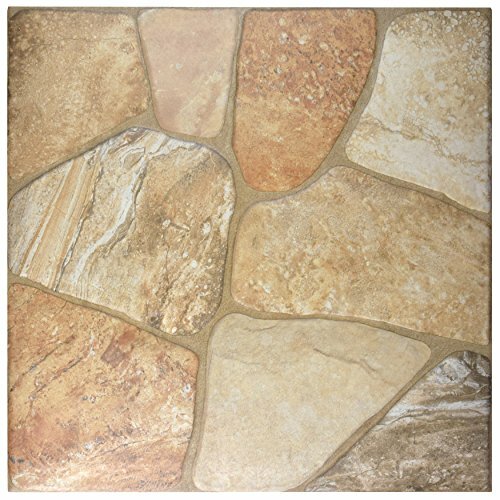 At just under 18 inches in width and length, you'll be able to cover quite a lot of space with each tile. That can ultimately mean you need fewer tiles overall. 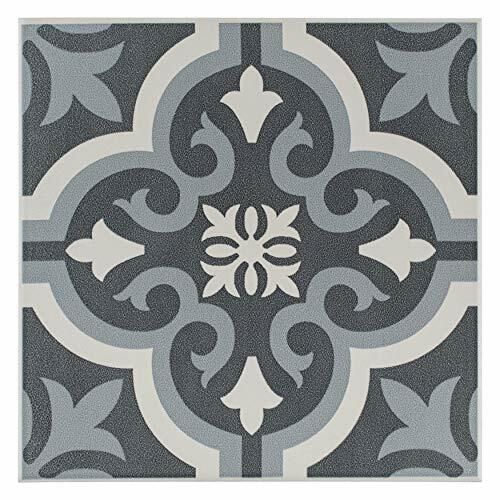 For those who have flooring experience, these tiles can be rather easy to install. They are also made to be nonslip so you won't need to worry about them being dangerous under more humid circumstances. 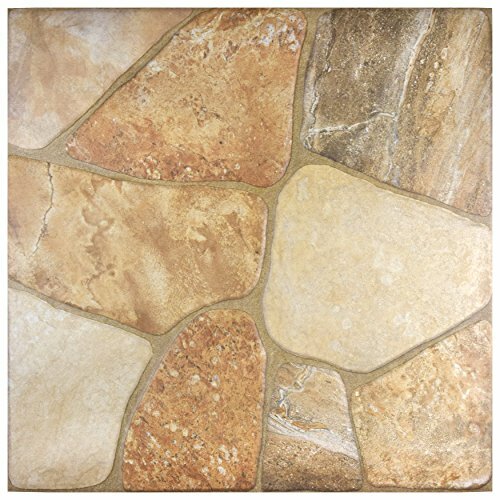 Some customers do find that the colors on the tiles they receive are more muted than what is displayed in the pictures. It's also important to keep in mind that some tiles can be broken during shipping. Tile flooring is available in a wide range of materials, including cork, granite, laminatae, linoleum, marble, pargquet, sandstone, slate and vinyl. Your tile flooring design concept affects your selection, of course, so examining your options is important. Will your design require removing tile flooring first, or can you work over what you have? Installing tile flooring can be tricky so adding a professional installer to your plans is another important consideration. Tile flooring is a wonderful direction to take for functional and attractive flooring. What is your concept of tile flooring? 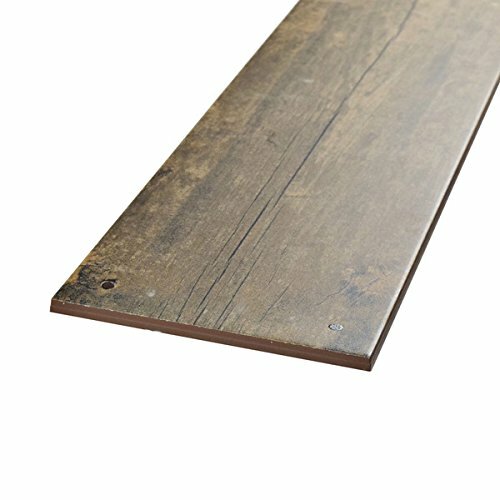 Ceramic flooring? Vinyl tile? Maybe parquet tiles? Those ideas and more fit into the category of tile floors and tile flooring design. Tile flooring consists of small pieces of material, or tiles, which are applied to floors with adhesives. There are a number of tile options available. You can select vinyl, cork, laminate, glass, slate, stone (flagstone and sandstone being examples), granite, wood, marble, or ceramic tiles. This range of options allows you to select floors that could look great in every room of your house. Tiles created for flooring can be mixtures of materials (such as clay, scraps, strips or plastic) that are pressed into flat identical shapes, or they are natural materials cut into shape. We will be discussing most clay tiles here, however, since clay tile flooring is by far the most popular option today. Clays are mined and shipped to manufacturers, who then press the material into thin strips. Most manufacturers fire tiles at high temperatures and then coat cooled tiles with special sealants or glazes in order to increase hardness and ensure long-lasting flooring. In Bicottura (Italian for double fired) tiles, the clay of the tiles is heated twice during manufacturing. The clay is first pressed and then fired once in a kiln. The clay is then glazed and fired again, creating a tile that is used only for decorative, interior wall tiles. Monocottura (Italian for single fired) tiles produce more durable tiles because they have a denser body. In this process, clay is fired in a kiln 2200 degrees Fahrenheit (1204 degrees Celsius) only once. Manufacturers then cut the tile materials into small individual tiles. In most cases, tiles are cut into small squares, although rectangles and other shapes of tiles are also available. Some tiles are also left unpainted and unglazed, to allow buyers to add their own finishes. Tile is a processed product which is shipped ready to install. The flooring simply needs to be attached to the floor. Some manufacturers actually place adhesive on the back of each tile; to install, simply remove the backing and press the tile firmly on a clean, dry surface. Other tiles need to be attached with adhesive substances which are applied before they are attached to the floor. Once the adhesive has been given time to dry, the tiles will be firmly in place. Some tiles don’t need any more work to be ready for use, while others require grout being applied between the tiles, and many need to be sealed before they are ready for use. Tile floors, since they are made from different materials, have different hardness ratings. Materials, glaze, and even the tile manufacturer can mean different hardness for similar products. The hardness of most tiles, however, is judged by glaze. Surface hardness of tiles is measured by the MOH scale (measure of hardness). Tiles are given ratings from 0-5. 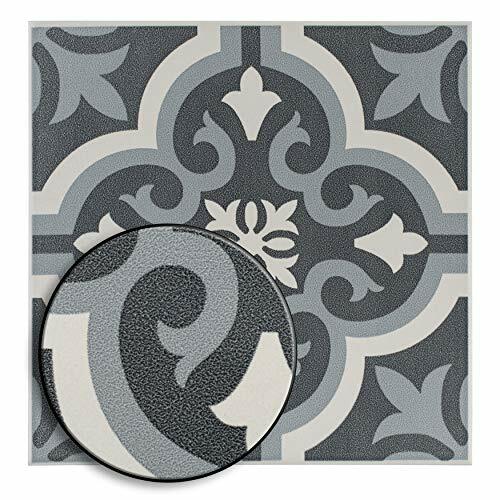 Zero designates tiles that are decorative only and should not be used as flooring. Tiles with a ranking of five designate surfaces that are very hard and can stand up to very heavy foot traffic. Tile floors have been prized for their beauty and durability throughout history. First used in the fourth millennium B.C., tiles were used by the Romans to create beautiful tile mosaic floors and art. In the 12th century, Europeans rediscovered the beauty of tiles when monks created intricate tiles to decorate places of worship. Tiles fell out fashion again until the 1800s, when new machines and factories were able to mass produce porcelain and ceramic tile flooring quite cheaply. New technologies such as “dust-pressing” allowed tiles to be made more quickly and in a greater variety of patterns and colors. Many people are afraid of tile flooring because they worry that tiles chip or peel. While older tiles may have this disadvantage, today’s tiles create very durable flooring. Although homeowners also worry about installing and removing tile flooring, modern technology has also reduced these previous flooring disadvantages. Removing tile flooring can quickly be done by heating the tile adhesive with a heat gun or stripper. Much of today’s tile flooring is so thin that it can be applied over old floors, eliminating the need to remove unwanted tiles. Tile floor coverings have many benefits, as well. If you are worried about the environment, for example, tiles of recycled materials are available. Glass tiles are literally made of recycled bottles and auto glass. Many tile floors are odorless, a great feature for chemically sensitive people. Unlike carpet flooring and porous flooring such as wood, tiles that are installed with low-VOC (volatile organic compounds) or zero-VOC thinset, can actually contribute to high indoor air quality. Residents can quit worrying about allergies when they have hard surface flooring, like tiles, because dust, mites and molds are minimized. Tiles that have either been made with a hard glaze or have been sealed after installation, many won’t absorb liquids. Spills can be quickly cleaned up with a cloth, leaving no stains or odor. If you have concerns about slipping when the floor is wet don’t worry, many tiles today can be glazed with a special no-slip surface that is appropriate for ADA (Americans with Disability Act) compliance. And if you have a non-level floor, a floorw with intentional tilt (like in a shower, garden room or commercial kitchen where you want to flow toward a draian), using small tiles in covering the floor will give you a level surface and accommodate the tilt. It’s the perfect blend of style and function! If you want an environmentally friendly, durable, affordable, elegant, and healthy covering for your floors, tile flooring may be ideal for you. By selecting quality tiles, you will be making a choice that will add years of beauty to your floors. 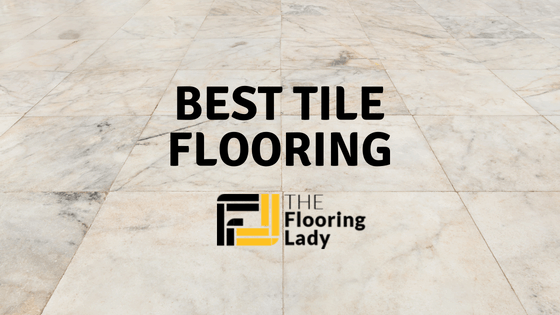 At the top of this list is the Tumbled Travertine Tile. 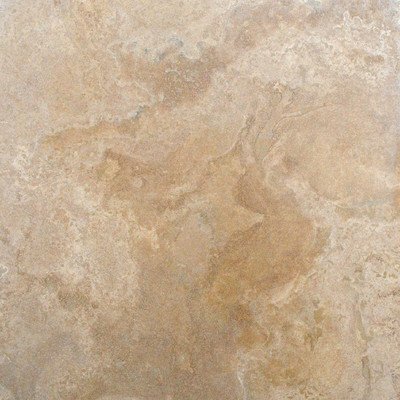 It's a great-looking tile with a smooth, marbled appearance. It's also decently priced and offers a little added safety through the non-slip design. It's truly a great choice if you're looking for something that can create an elegant look without being too loud. If you find that these tiles aren't the ideal option for you, all of the others in this list also come highly rated and are sure to improve any space.